Isabella McCorkle was the second child born to Francis Marion McCorkle Sr. and Sarah Jean Work. 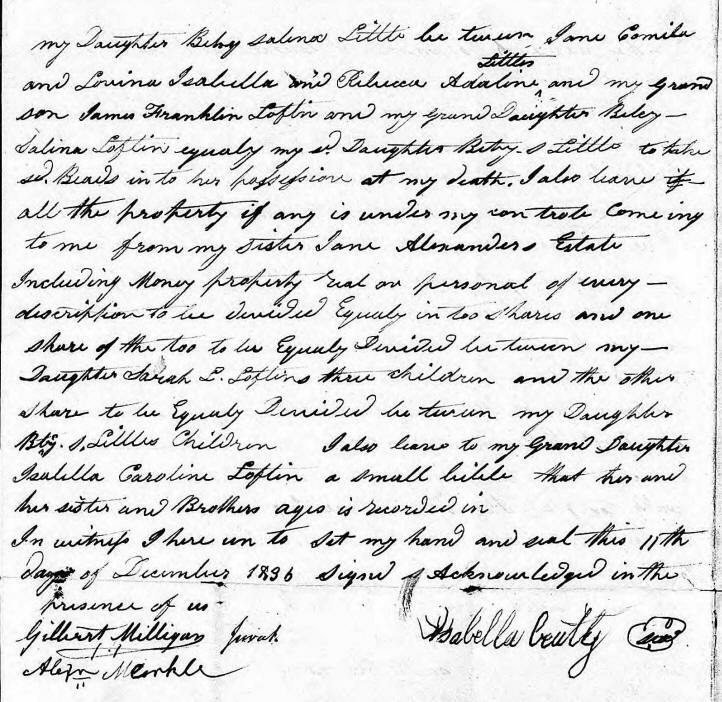 Isabella was born 28 May 1771 in Lincoln Co, NC. Isabella McCorkle married William Able Beatty on 21 Apr 1791 in Mecklenburg Co, NC. Tho(ma)s McCorkle was bondsman and James Meek was the witness. Their marriage produced three children. Like everyone else in Lincoln County, NC, in the 1700 and 1800s, William and Isabella McCorkle Beatty raised what they needed on their farm. Hunting wild game also provided meat for the family meals. 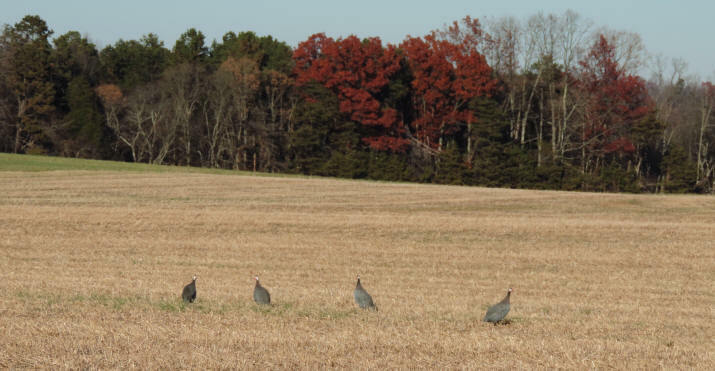 North Carolina offered a variety of mammals, birds and fish including: deer, elk, beaver, opossum, squirrel, rabbit, raccoon, quail, duck and catfish. William Able Beatty died 25 Aug 1818 in Lincoln Co (Catawba), NC. In the name of God amen! I ISABELLA BEATTY of the county of Lincoln and State of North Carolina being of sound mind & memory but weak in body do make and publish this my last Will and Testament in the following manner, that is to say, I give and bequeath to Charles Beatty my only son, a note on him for three hundred and seventy three dollars bearing date the twenty eight day of October one thousand eight hundred and nineteen, that if the said Charles Beatty will pay out of said note to his second daughter Betsy Alvin Beatty ten dollars and all the rest of his children five dollars to each one which is now in existence the said note above described now in the hands of Gilbert Milligan and payable to me, and one bed and furniture and one writing table one large pot and pot rack hooks too flat irons one stone jug a check reel and all my books except a small Bible. 2nd I leave and bequeath to my granddaughter Isabella Caroline Loftin, a feather bed and under bed and bedstead, one bolster and too/two pillows one sheet, one blanket, one coverlet worn some, one new, one her choice, one calico quilt her choice, and a white knotted counterpen. And I leave and bequeath to my grand daughter Betsy Salina Loftin, one sheet, a blanket, too/two coverleds, one calico quilt, a white corded counterpen, these beds and furniture is what I allow for my daughter Sarah L (Lavine/Viney) Loftin the mother of the above named my two granddaughters. I also leave to Isabella Loftin one walnut chest and one dinner pot. I leave also a large stand of white curtains to my too/two granddaughters above named to devide as they please I also leave my grandson James Franklin Loftin, one sheet and checkered counterpen and piece quilt, this is part I allow his mother. I also leave to my daughter Betsy Salina Little the balance of my bed clothes and wearing clothes. I also leave to my grand daughter Lavina Isabella Little a pine chest I also leave my beds I lie on and cover with bolsters and pillow to be equally divided by my daughter Betsy Salina Little between Jane Camilla and Lavina Isabella and Rebecca Adaline Little and my grandson James Franklin Loftin and my grand daughter Betsy Salina Loftin equally by my said daughter Betsy S. Little to take said beds into her possession at my death. I also leave all the property if any is under my control coming to me from my sister Jane Alexander's Estate including money property real or personal of every description to be divided equally in two shares and one share of the two to be equally divided between my daughter Sarah L. (Lavina/Viney) Loftin's three children and the other share to be equally divided between my daughter Betsy S. Little's children. I also leave to my grand daughter Isabella Caroline Loftin a small Bible that her and her sister and brother's ages is recorded in In witness I hereunto set my hand and seal this 11th day of December 1836 Signed acknowledges in the presence of us". The ???? Will was proved in open (in open) Court by the Oath of Gilbert Milligan a ???? ???? and Bonded. 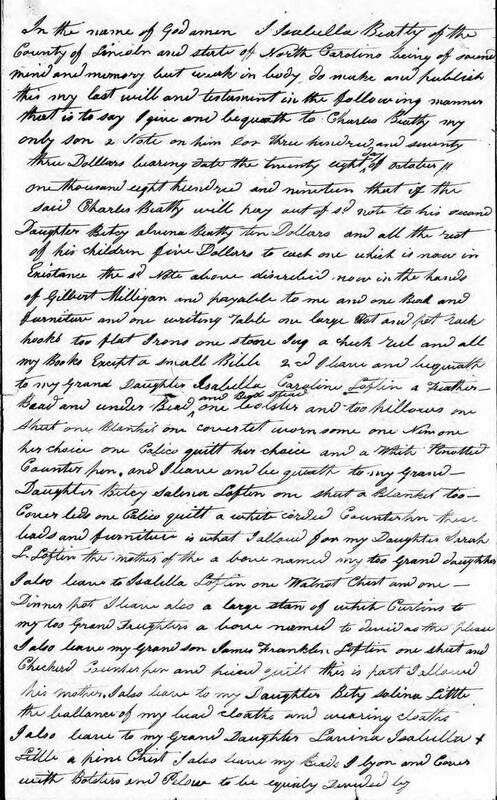 Isabella died 26 Oct 1842 in Lincoln Co (Catawba), NC. She is buried in the McCorkle Family Cemetery in Catawba County near her father, mother and several of her siblings. Unfortunately, vandals have damaged several of the headstones in the McCorkle Family Cemetery, including that of Isabella Beatty. This is the way you'll find the headstone, [below] if you visit the cemetery. If you have photos or additional information about Isabella McCorkle, please contact me.